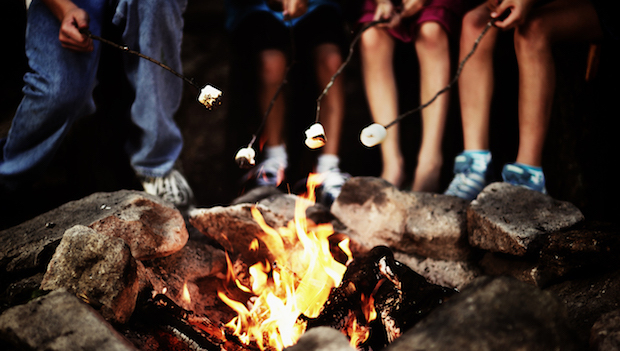 There's nothing like the tempting smell of marshmallows toasting or hot dogs roasting over an open fire. But, when you're cooking outdoors, campfire safety is of the utmost importance. So, before you get dinner started, you need to be sure you're not just enjoying a meal, but staying safe, as well. Here are five simple fire safety tips for your next camping adventure. Campfire safety starts well before the fire gets roaring. When scouting out your fire pit, make sure it's not under any low-hanging branches or near any brush or bushes. Items like these can easily go up in flames if the fire gets bigger than anticipated. Also keep a radius of eight to 10 feet around the fire pit clear of tents, chairs, food and any other debris or obstructions. Clear all debris from around the fire pit, including garbage and grass. There should be a five-foot perimeter of soil around the campfire space. If there is no metal ring, circle the pit with rocks. If your fire grows in size, this will help keep it within the borders of the fire pit. Keep any flammable items far from the fire. This includes aerosol cans and pressurized containers. If you ever have any questions, you can always call over your campground ranger. Campfire safety is their top priority, and rangers can double-check whether or not the pit is ready to use. It's always better to be safe than sorry.